When transferring files between a computer and a mobile device, most of us either use the data cable for connecting the two devices, or transfer the files over Bluetooth. Both of these methods have their own advantages and shortcomings. Speed over Bluetooth is less. Transfer occurs at high-speed when using the cable connection. Carrying the cable with you all the time may be difficult and keeping the cable connected to both the devices can be difficult too. Older laptops and most PCs don’t have a Bluetooth adapter built-in. You will have to attach an external Bluetooth dongle to transfer files using Bluetooth. This brings us to think of a different way to transfer files, and WiFi is the ideal solution so far. But there are very less applications that lets you do that, and AirDroid is the best one. Before learning to set-up AirDroid with your device, lets first see what it can do for you. AirDroid lets you transfer documents, music, videos, images and other stuff to and from your Android device over WiFi. No cables required. You can add, edit and delete contacts from your Android device using your computer itself. No hassles when you think of cleaning up your contacts list. It’s just a matter of seconds on the PC. If you hate typing long replies from the touch screen of your Android device, then try reading and composing messages via AirDroid on your PC. It provides the comfort of typing on a keyboard and reading on a bigger screen. Sorry WhatsApp users, you can’t read or reply to WhatsApp messages using AirDroid. Try Bluestacks to use WhatsApp on PC. If you ever want to use and take photos from your device’s camera while watching the preview on your PC, then AirDroid can do that too. You can take photos while watching the Camera’s output on the large screen of your PC. You can activate the flash too. You can export and import .apk files to install applications on your Android device and for keeping a backup of the ones already installed. AirDroid requires no installation on your PC, only your mobile device needs to have the AirDroid application. Every thing is handled from within your browser. There are many other features of AirDroid. Above were just the ones I love to use. Install AirDroid on your Android device. 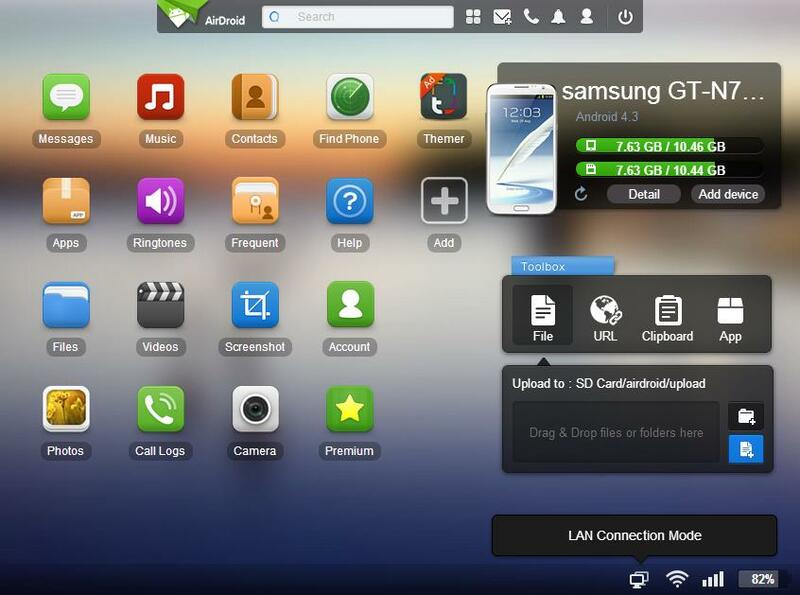 Enable the WiFi or mobile network of your device and start AirDroid. You will be asked to open any of the two given web addresses (one is http://web.airdoid.com and the other will look something like http://192.168.1.79:8800) if you are connected via the WiFi, and only the web one if you are using the mobile network. You have to open this URL in your web browser on your PC. Once opened, you have to scan the QR code shown in your web browser with the camera of your device. 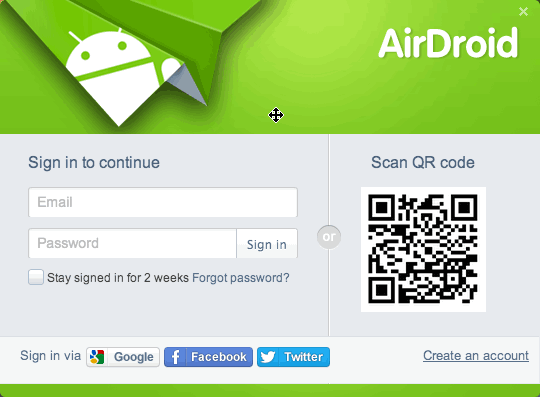 If you succeed in scanning the QR code, then you will be able to do everything that AirDroid is capable of. Go ahead and play with your Android device through your PC. You can also create an account on AirDroid and operate you device even when you are far away from the device using internet connection. But make sure, the device has an active internet connection and the AirDroid service is running.